National Park Smolenskoe Poozerie, in Demidovsky and Dukhovitsky Districts of the Smolensk Region, was established an 1992. Its area is 146,3 thousand ha. 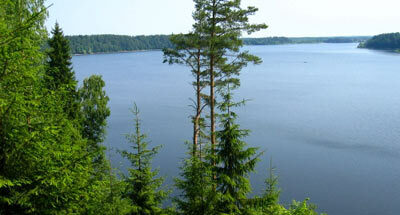 It comprises the river Elsha basin, Mezha's tributary, which flows into the Zapadnaya Dvina River. Landscapes of valleys with various features of glacier and water-glacier relief on the Southern border of Valdaiskoe glacier are present. There are more than 30 large and small lakes, communicating by channels — Bolshoe and Maloye Strechnoe, Krugloe, Dolgoe, Glubokoe, Baklanavskoe, Dgo, etc. 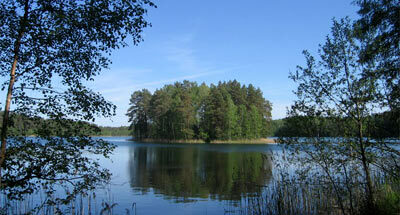 Passing in the Park is the boundary of the southern-taiga coniferous and sub-taiga broad-leaved-coniferous forests. Woodland accounts for 74% of the Park area. Mixed forests prevail (spruce, pine, oak, ash, maple) as well a secondary parvifoliate forests. There are plots of primary complex spruce forests is with sorrel, which were never felled; and large areas of oligotrophic sphagnum moors. The fauna comprises 57 mammalian species, 190 birds, 5 reptile and 10 amphibian species. The common mammals are the moose, wolf, red fox, least weasel, ermine and lynx. Rare avian dwellers are: the white-tailed eagle, osprey, short-teed eagle, golden eagle, black stork. Dwelling in lakes and rivers are up to 28 fish species, including whitefish, bull trout and brook trout. 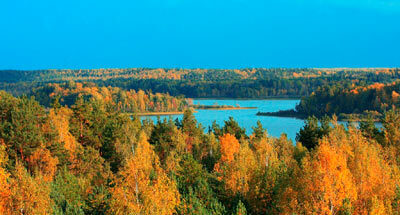 There are archeological sites of Stone, Bronze and Iron ages, remains of the ancient town Verzhavsk near Lake Rzhavets.